I usually download movies from the net and view them in my pc or in my home theatre. The movie files that I download are usually in .avi formats. Well, such files are great as far as pc is concerned as you’ll have the whole movie in just one .avi file. Moreover, it’s easy to store and consumes less space too. But unfortunately my home theatre doesn’t play .avi files. I have to convert the file in to Video_TS and Audio_TS and then burn in the form of a DVD for viewing in my home theatre. But if you are a lucky guy who has a home theatre which plays Divx files then you don’t need to go through all this conversion mess as it will play the .avi file without any problem. 1. To start with click on the Browse icon in the Input File row and select the IFO file of the Video_TS folder that points to the full movie. It usually contains the same digit as the largest amount of VOB files in the folder. 2. If you selected the right IFO file, AutoGK will display the playtime of the selected movie. If the DVD has more than one main track then you need to repeat the step and merge the files later on. 3. Check/ Uncheck the available languages and subtitles. 4. Now, select the output file and size for the video that will be created. The output file size can be selected by picking a predefined size that ranges from 1/4 CD (175 MB) to 3 CDs (2100 MB). Several additional options are available for DVDr sizes. The user can also select a custom size if he likes but most should find a suitable one among the predefined sizes. 5. 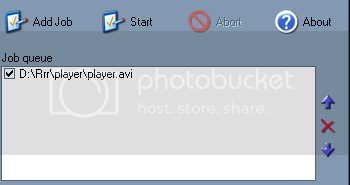 The output file is simply a link to the .avi file that will be created. 6. You can also configure several optional parameters in the advanced settings. This ranges from selecting an output width to a selection of the video codec and output format. 7. Lastly, add the process as a job to the job queue and click on the Start button to encode all jobs in the queue. You can also add additional jobs and let them run overnight. Once the conversion process is done, you’ll get a single .avi file.